Long summer days are nearly upon us. School ends for our oldest daughter this week and ends next week for our two younger girls. What activities will fill our days this summer? In addition to our busy days of dance camps and tennis lessons, hours in the pool, and keeping up with summer reading and vacations—we discovered a wonderful program that encourages families to serve others during the summer. 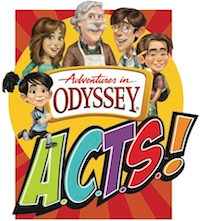 Adventures in Odyssey (AIO) launches A Call to Service (A.C.T.S.) this week—and it is a fun way to encourage kids to give back to family, the community and even the world. As a bonus, participants are eligible to win prizes and have the opportunity to win a mission trip to a foreign country to continue service beyond the summer. What is A.C.T.S. ? A Call to Service is a collaboration of Adventures in Odyssey, an audio program focused on strengthening faith and families, Clubhouse Magazine and Christian bookstores across the country. Through A.C.T.S., kids across the country are invited to join in a Summer of Service. Whether participants serve families, communities or the world through faith based giving and activities—the program promotes the biblical message, “When you serve, everybody wins,”. A.C.T.S. Program and contest details. Kids participating in the A.C.T.S. program may either pick up a service log at a participating bookstore—or download a service log online. During the summer, kids will attach character stickers for each service hour. At summer’s end, kids can record and submit a video explaining how they serve—and why they would like to become an Adventures in Odyssey Ambassador. One hundred winners will receive the new Adventures in Odyssey album, and after online voting, two grand prize winners (one boy and one girl) will win a Good-Goers Mission Based Adventure trip to another country with a parent! The out-of-country destination will be announced on a live podcast May 22 —hosted by AIO actors Katie Leigh (Connie) and Chris Anthony (Chris). Ready to serve with A.C.T.S.? We will be participating in this program throughout the summer—and the girls and I will be blogging about our adventures along the way. Need some ideas? A.C.T.S. offers PDF of service ideas to get your family started on a summer of service! We’ll also be offering our own insights and even a fun giveaway a little later in the summer—so stay tuned! Disclosure: We are participating in a blog tour with Tyndale Press in promoting the Adventures in Odyssey audio series and the A.C.T.S. Program. We will receive a complimentary copy of the AIO cast favorites and will be provided with a prize for a giveaway later in the summer. All opinions about this program are our own and we will be personally participating.